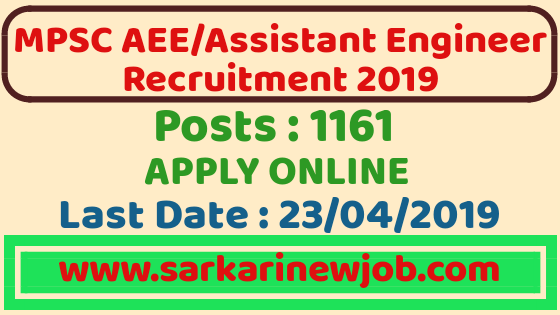 MPSC Recruitment 2019 | AEE/Assistant Engineer | 1161 Posts | Last Date: 23 April 2019 - Sarkarinewjob.com A ultimate job portal to provide employment news. Maharashtra Public Service Commission invites applications for the post of Maharashtra Engineering Services Preliminary Examination 2019 (1161 Vacancy). Apply Online before 23 April 2019. MPSC Recruitment Qualification/ eligibility conditions, how to apply & other rules are given below.Official website is www.mahampsc.mahaonline.gov.in. Before applying for MPSC 1161 Vacancy, candidates must ensure that they fulfill the required eligibility. · ** KNOWLEDGE OF MARATHI IS COMPULSORY .